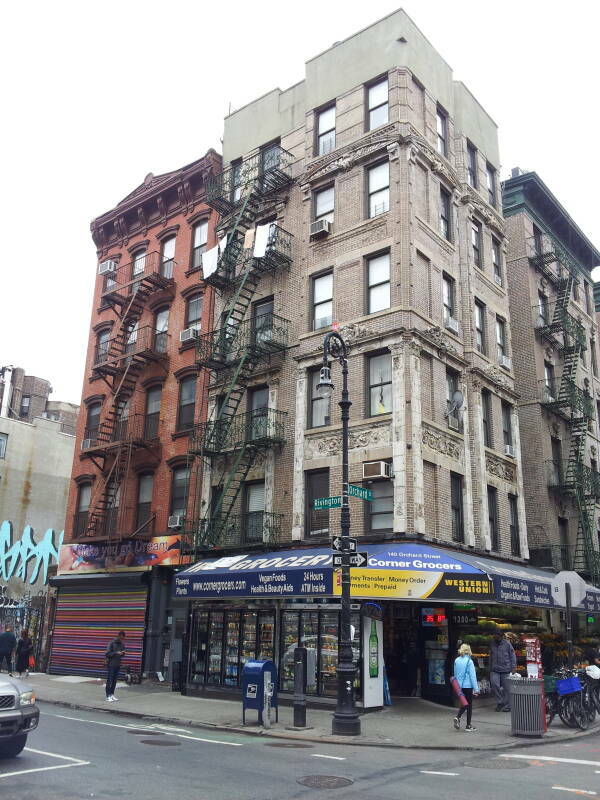 The Lower East Side is an area of Manhattan roughly bounded by Houston Street on the north and Canal Street on the South, and by Bowery on the west and the East River on the east. 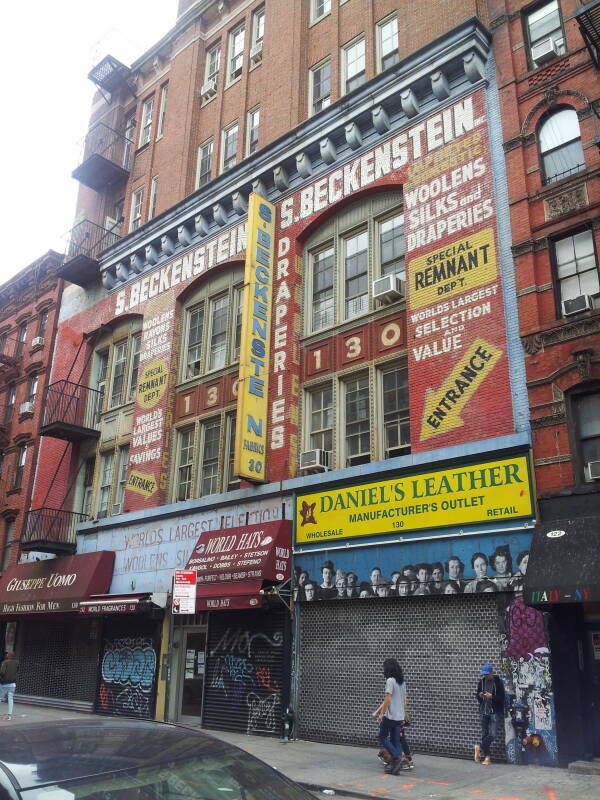 From the mid 1800s into the 1900s it was a busy community of immigrants, many of them Jewish. Many immigrants arrived between 1880 and the early 1920s, moving into increasingly crowded conditions. From 1881 through 1914, approximately two million Jews immigrated to the U.S. from Europe. 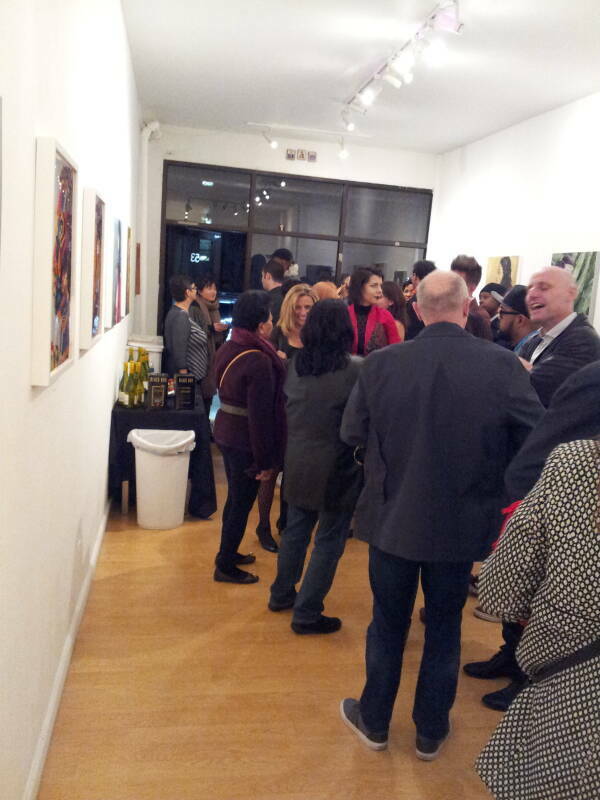 About 75% of them settled in New York City, most of those on the Lower East Side. In 1900-1910 almost 500,000 residents of the Lower East Side were Jewish, making this the largest Jewish community in the world. The next two largest Jewish communities in the U.S. were in Chicago and Philadelphia, each with less than 20% the number in New York. Most of their descendants have now moved out, but many cultural and architectural influences remain. Imperial Russia had defined the Черта Оседлости or the Pale of Settlement after its conquest and absorption of parts of the Polish-Lithuanian Commonwealth in the late 1700s. From 1791 to 1917, Jews now within the Russian Empire were restricted to living in this area that included much of today's Latvia, Lithuania, Poland, Belarus, Ukraine, and Moldova. Even within this region, they were prohibited from living in some cities. There had been anti-Jewish riots and massacres in Europe since the Middle Ages. Then Czar Alexander II of Russia was assassinated in 1881, and the Russian government blamed the Jews. This triggered a wave of over 200 massacres of Jews within the next few years in the Russian Empire. These attacks came to be called pogroms from the Russian word погром, derived from громить, meaning "to destroy." The pogroms continued into the early 20th century. One estimate is that 1,326 pogroms in Ukraine between 1881 and 1920 killed between 70,000 and 250,000 Jews and left half a million homeless. Relatives who had already made their way to the United States raised money to buy transport for those still in the old villages. Over 75,000 of the Jewish residents of the Lower East Side were from Romania, where antisemitic laws, violence, low crop yields, and economic depression drove 30% of the Jewish population of Romania to emigrate to the U.S. Many of them settled in New York, and of those, many went to the growing "Romanian quarter" within the Lower East Side. 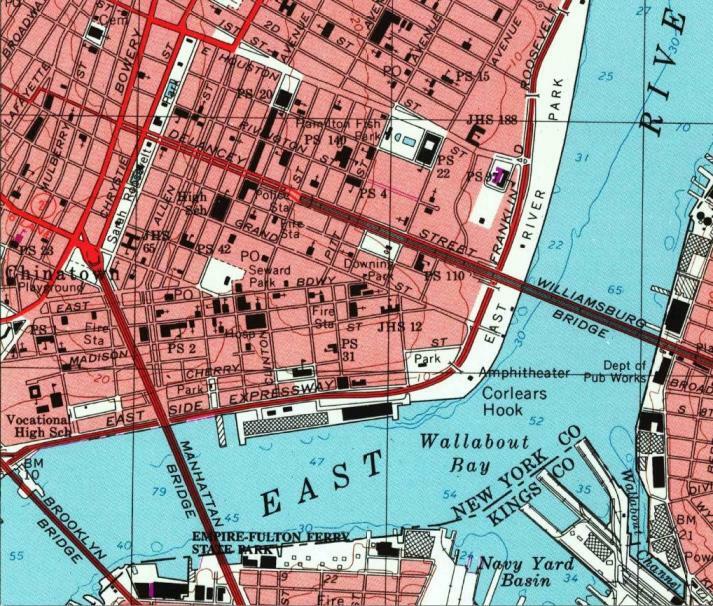 This was bounded by Houston and Grand streets to its north and south, and Allen and Ludlow to its west and east, so about five blocks north to south and two blocks west to east. This was the most densely populated area of the Lower East Side, possibly in the entire world, with 1,500 to 1,800 people per block in crowded tenement buildings. The Jewish immigrants who arrived during the mid to late 1800s through the early 1900s were predominantly from Eastern Europe. They were of Ashkenazi rather than Shephardic descent. The Romans banned the Jews from Jerusalem in the 130s CE. They migrated out into the Roman Empire, through the Italian peninsula and into southern Europe where Jewish communities had already existed since pre-Christian times. Of course, large numbers were already living in Greece. Jewish communities existed throughout today's France by the 500s. Then Charlesmagne's expansion of his empire around 800 brought stability that allowed more Jewish settlement north of the Alps. The Shephardim became a distinct community in the Iberian peninsula, today's Spain and Portugal, around 1000 CE. They spoke a Judaeo-Spanish language, derived from Old Spanish with additions from other Romance languages, Hebrew, and Aramaic. They lived there until they were expelled in 1492. They returned eastward and settled throughout the Ottoman Empire, an Islamic empire that welcomed them when they were driven out of Christian Spain. The Ashkenazim also became a distinct Jewish community around 1000 CE. However, they lived throughout Central and Eastern Europe. Yiddish appeared, a Germanic language written in Hebrew script. It had loan words in Romance languages, and picked up Slavic components as the Ashkenazim gradually moved east. The Jews who stayed behind in France and Germany were segregated, but made efforts to become part of the local society. The Ashkenazim who moved further east were more segregated, by the surrounding culture and also by themselves. 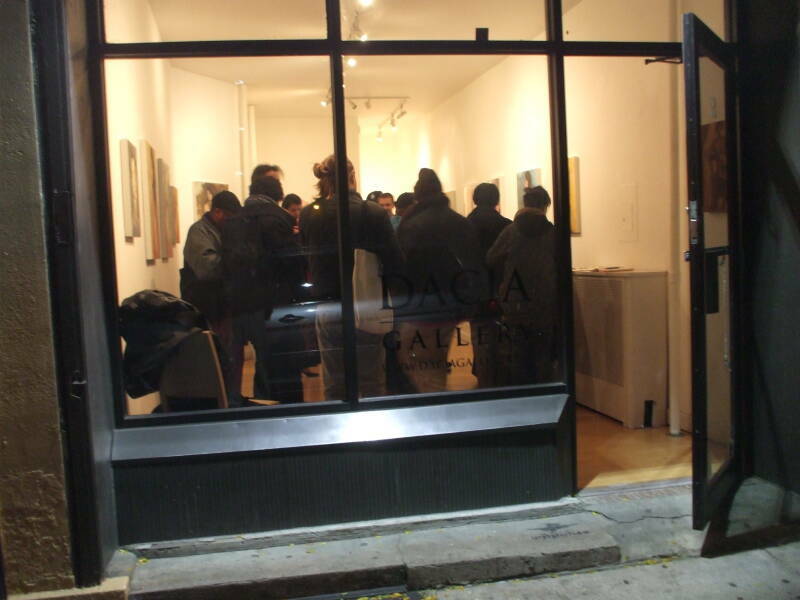 The self-segregation and local anti-semitism tended to intensify each other. The Ashkenazi Jews who immigrated to the Lower East Side were strict Orthodox, largely from Romania, Poland, Lithuania, and other areas within Imperial Russia at the time. They were moving from the shtetl, the small exclusively Jewish village, to the crowded tenements of this district of a large American city. Dumbbell tenement floor plan from How the Other Half Lives by Jacob Riis, 1890. 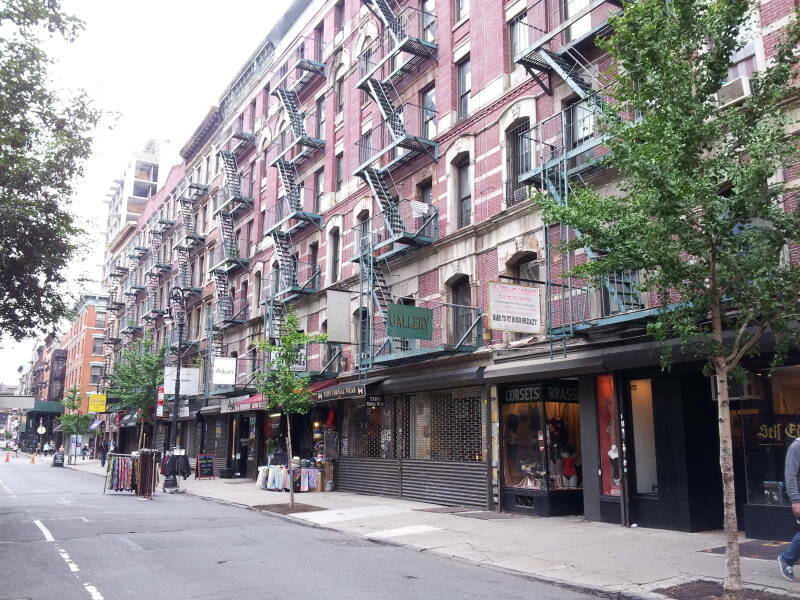 A tenement building has multi-family rented accommodations. As defined legally in New York State in 1867, a tenement was a building occupied by more than three independent families, each doing their own cooking and sharing the halls, stairways, and toilets. The lots were 20 to 25 feet wide along the street and 100 feet deep. Most tenement buildings filled over 90% of that space. Typical buildings had 18 rooms on each of five or six floors. Tenements built in the early through mid 1800s had windowless rooms, some of which served as passageways to rooms further from the stairs. Only the two rooms at the front had windows. The other rooms had no ventilation. The Tenement House Act of 1867 prohibited cellar apartments below street level. The completion of the Croton Aqueduct had brought running water to wealthier citizens. This reduced the use of wells, raising the water table and flooding cellars. The 1867 act also required fire escapes and one toilet for every 20 residents. The Tenement House Act of 1879, called the Old Law, required that every inhabitable room have a window opening to the exterior, and the building could cover no more than 65% of the lot. The New York City Board of Health didn't enforce the Old Law, and a compromise became the de-facto standard. 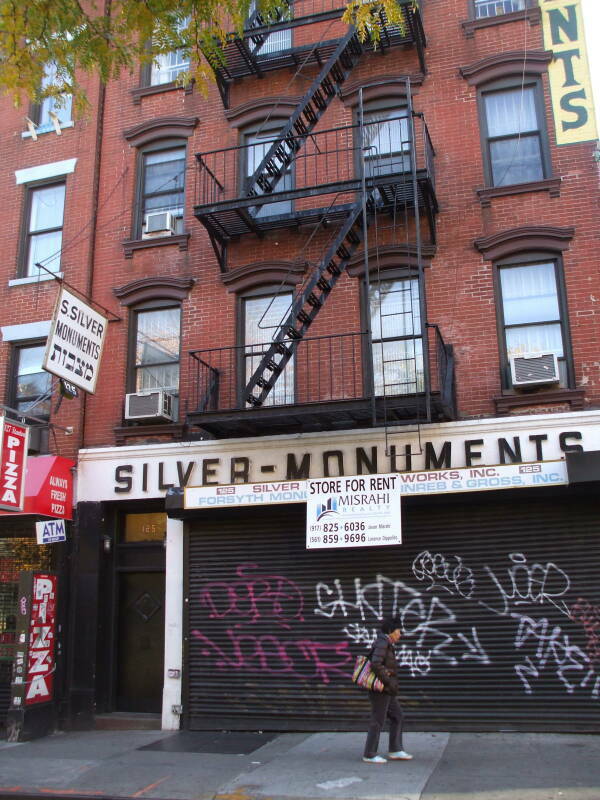 This was the "dumbbell tenement", which touched its neighbors at the front and back and was slightly narrower through its middle. The shallow notch at each side formed a narrow air shaft between it and the adjacent building. Typical Old Law Tenements had four apartments of three or four rooms each on every floor above street level. There were two shared toilets on each staircase landing. Many of the families worked in their homes. There were fabric and clothing companies in the area. A lot of labor was done in tenement apartments, sewing new pieces and also mending and cleaning work. 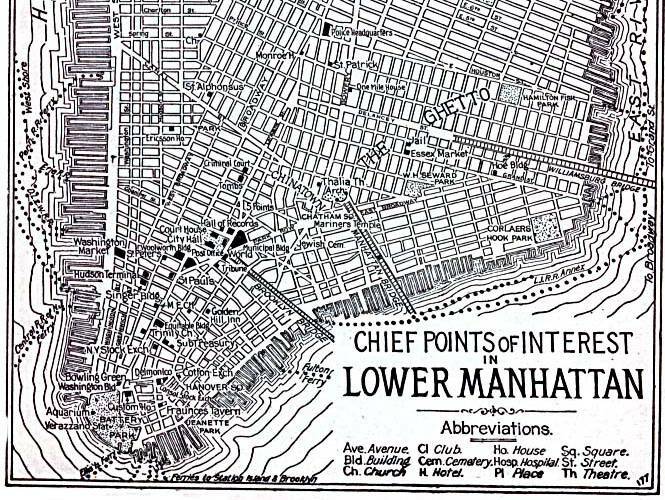 The chief points of interest in Lower Manhattan, according to a map from 1920. "The Ghetto" is written across the Lower East Side. There are still some reminders of the area being the Romanian quarter. 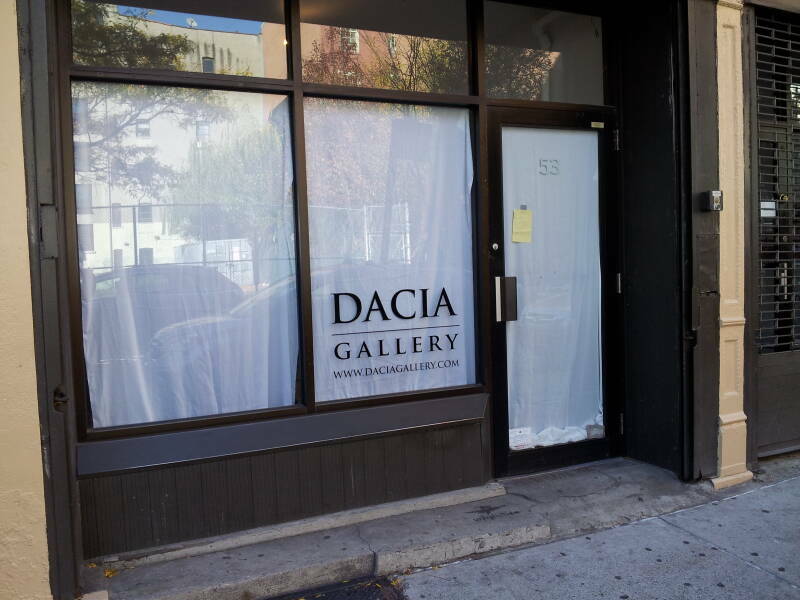 This art gallery on Stanton Street bears the Roman name for today's Romania, Dacia. The Roman control of its province of Dacia led to modern Romanian being a Latin-based language isolated in Eastern Europe. It is surrounded by neighbors speaking Slavic languages, plus the Hungarians speaking their non-Indo-European Magyar language. Meanwhile, the Jewish population of the Lower East Side continues shrinking. Most businesses focused on the Orthodox community have closed. 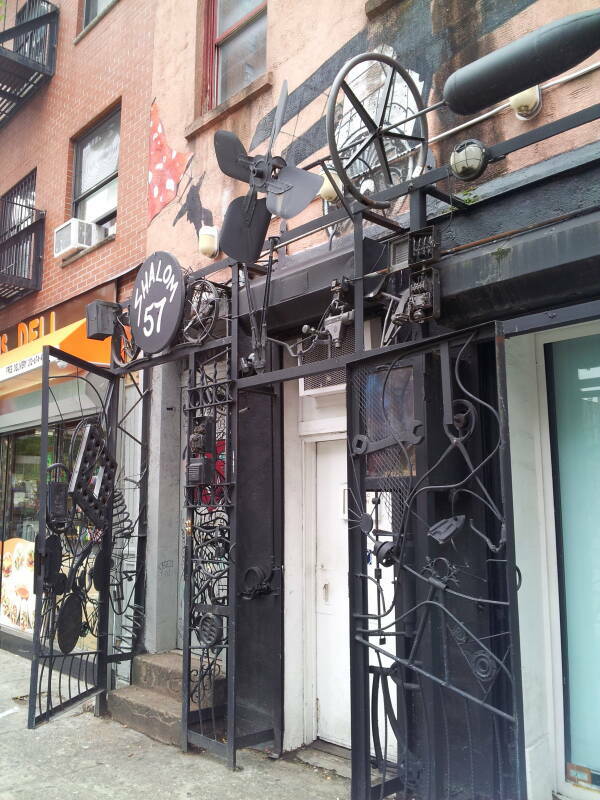 We will see some of the distinctive food stores along East Houston Street, along the north edge of the Lower East Side.